Details have emerged that pastor Cosmas Chileshe, the spokeperson for the Zambian embassy in the United States told lies in the Kitwe High Court on his real earnings as a diplomat. 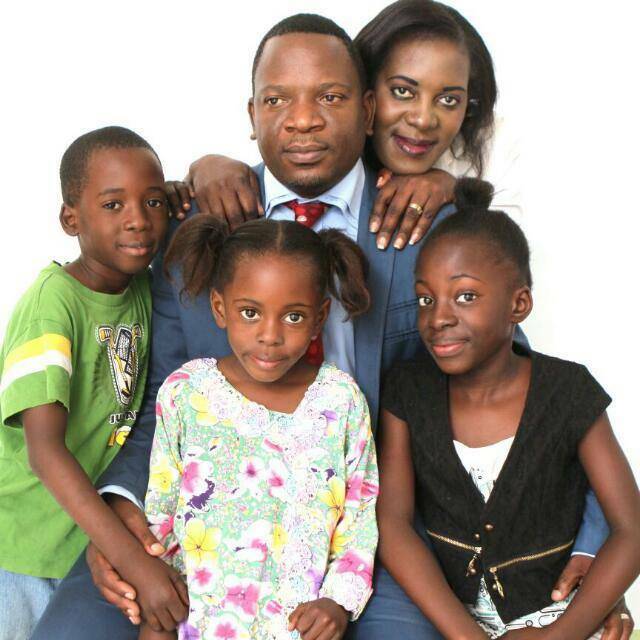 In February this year, Pastor Chileshe divorced his wife he married in 2006 and have four children with. But during hearing for alimony (maintenance of former spouse) pastor Chileshe criminally lied on oath that his salary is only K6, 000. He told the court through his lawyers that since he only gets paid K6000, he can only afford to give the wife and his 4 children K1,500 per month. Lying in court is a criminal offence called perjury and the liar can be jailed. The truth is that Pastor Chileshe is paid K76, 000 every month. All Zambian Diplomats have double salaries. At home they are paid (K6,000). Then they have monthly allowances paid at station $7000. This is roughly K70, 000. This is in addition to free accommodation and other benefits. But pastor Chileshe only told the court about the K6, 000 which is paid in his account in Zambia. Pastor Chileshe wants his ex wife and four children to share K1500 the entire month while he and Aunty Maureen enjoy the K74, 500 plus the mansion in Washington. As he is doing this, pastor Chileshe knows that his wife took a four year unpaid leave so that she can be with him in USA when he was appointed diplomat. He even got her pregnant for the fourth time during this same time. Other details are that during rough times, the ex wife took care of pastor Chileshe as her father, Chendenda Musonda, was the police commanding officer for Lusaka province. Now that it’s pastor Chileshe in gainful employment, he has turned his back on the family and is busy chasing an older woman. Pastor Chileshe wants to marry veteran broadcaster Maureen Nkadu. Maureen Nkandu is 51 years old and has a 30 year old married daughter with soccer icon Kalusha Bwalya. This is the girl pastor Chilshe should be pursuing (if she was not married) instead of her mother. Pastor Chileshe is 43 years old. 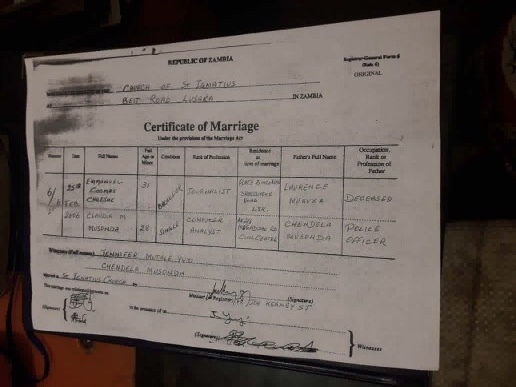 As can be seen from the marriage certificate, when pastor Chileshe married for the second time 12 years ago in 2006, he was 31 years old. Pastor Cosmas Chileshe was a reporter at Times of Zambia. He was fired becauseof alcohol. He ambadoned his wife in Garden township whenever he got his salary. At some point he deserted both his job and home leading to his dismisal.